Check out the latest podcast by Lanny Davis and previous podcasts here. 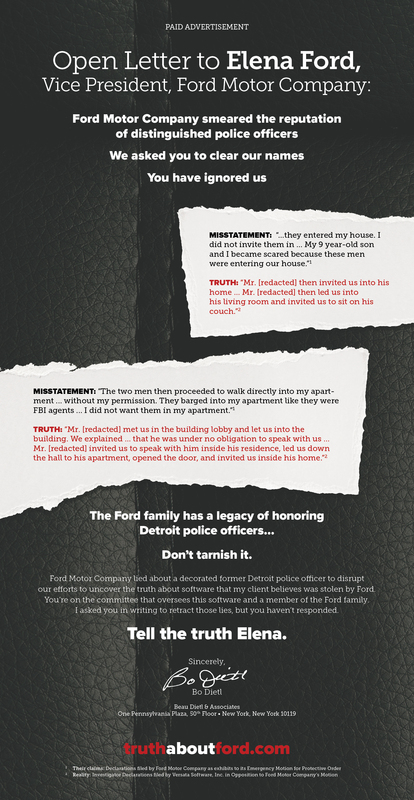 Click here for the latest involving Versata’s renowned investigator Bo Dietl, and his legal filing against Ford. Versata is a software company whose patented technology has revolutionized the automotive industry. Among Versata’s most valuable intellectual property is its technology for its patented automotive configuration manager software. Despite achieving billions of dollars in cost savings from its use of Versata’s software over the course of 17 years, Ford decided that it would be cheaper to steal this technology than to pay for it. Versata has filed a lawsuit against Ford in Texas federal court, accusing Ford of stealing its trade secrets to develop its own copycat technology. Ford had a licensing deal to use Versata’s software for 17 years but instead decided to try to develop and patent its own technology through theft, lies, and deception. Click here for a statement from Versata attorney Lanny J. Davis. STEAL: You can’t steal someone’s intellectual property and get away with it – especially when that property required years of effort, tens of millions of dollars of capital investment, and thousands of man hours to create and you benefit from using the property by significantly more that its cost. COVER UP: You can’t try to cover up your theft by breaking your word – failing to honor the plain terms of a written contract that allows the owner of the property access to your workplace to verify whether or not the owner’s intellectual property in deed has been stolen or compromised. MISLEAD: You can’t mislead the U.S. Patent & Trademark Office by applying for a patent without disclosing that your proposed “new” invention in fact was derived, in whole or in part, from copied trade secrets and patented software. DECEIVE: You can’t be allowed to use trickery and deception as a means to negotiate contract terms and then further violate the legal system by filing a “sealed” complaint contrary to the court’s rules in order to try to gain a tactical litigation advantage.